1: Please note I am a private seller and all records and Cd’s sold are from my personal collection, therefore business seller rules and regulations do not apply. 2: If you have any questions regarding the item for sale, please ask them before bidding. Any questions asked after bidding may result in your bid being cancelled. 3: My postage rates are as advertised. 4: I do offer returns which a private seller does not have to provide. So if you are unhappy with any of my items purchased, please follow the correct eBay procedures for returning the item. There is a 14 day return policy, so any request to return the item after this period will not be granted. Once I have received and inspected the item returned, and it is in its original state that it was sent, a full refund will be provided (I do not offer partial refunds, the item has to be returned). Should you wish to return an item as set out in EBay policies the buyer is responsible for the return postage cost, meaning I pay one way the buyer pays the other way. Please also insure that the item is sent back in its original package. 5: All Items will be sent Signed for, there are NO exceptions to this. 7: A word about hairline marks. It is almost impossible to find any non-sealed record without any hairline marks - many had them from new, particularly if sold with cardboard inner sleeves. They are a result of storage and use and have little impact on sound quality. 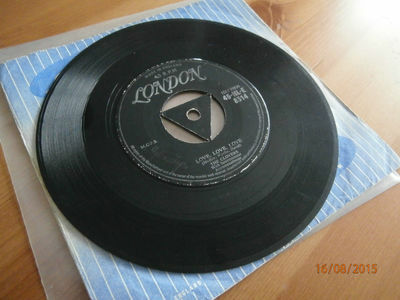 Likewise, very few original vinyl records lie totally flat. As for background noise, all records will have some background noise which varies wildly and often reflects the very variable pressing quality. I have bought new heavy pressing LP's in recent years and many of the original records I am selling not only look better but they sound better! I only draw attention to marks, warping or background noise in my listings if I consider them significant. Please also remember that some of these records are up to 60 years old! 8: I grade in line with UK Record Collector grading system as set out in the book, please note I do not use USA Goldmine grading. My only grading that's different to the Record Collector grading system is I will only grade a record Mint if it’s sealed, I do not ever grade an unsealed record mint. My highest grade for an opened lp is near mint. 9: I have so many records to sell, it would be impossible for me to play grade every one. So unless stated in my listing that it has been play graded it will only have been visually graded. All play graded records will be detailed as play graded. 10:There are no reserves on any of my auctions, so please remember that if you are the highest bidder, you will be expected to pay for the item. I always pack my records very well, they are mailed in proper record mailers with added stiffeners, and they are also posted as soon as possible after payment. 11: Although unlikely, I reserve the right to cancel bids or end the listing at any time. 12: Payment is required within 3 days of auction end. Vinyl: GOOD (LOTS OF SURFACE MARKS / LIGHT SCRATCHES). HAS SOME LIGHT BACKGROUND CRACKLING WHICH SONGS OVER POWER. THERE IS SOME LIGHT CLICKING AT THE END OF SIDE 2 OTHERWISE THE RECORD PLAYS THROUGH WITH NO MAJOR PROBLEMS. TWO GREAT DOO WOP TRACKS. THIS IS A VERY VERY RARE RECORD AND A GREAT ADDITION TO ANY SERIOUS COLLECTION OF WHICH I PERSONALLY ENJOYED HAVING.